Softly crouching red mesas, red temples and shrines, red hills where the spirit of the red man still resides crept into view as we left the airport in Albuquerque, New Mexico on our way to the Sai Retreat at Jemez Springs, N.M. Ho-Sen our driver and host welcomed us with a beautiful buddha smile. She was the leader of the Bodhi Mandala Buddhist Center where the Sai Retreat was being held. As we drove speedily along the Southwestern roads, I marveled at the intriguing formations jutting from the crimson landscape. Like clouds in the sky on a clear day a kaleidoscope of faces, forms, designs and patterns could be observed swirling across the rocky terrain. This was my first time in the Southwestern USA and I was looking forward to this new adventure. We were five altogether traveling from Florida: myself, David, Yolanda, Teresa and Andrew. Silently, I wondered whether I would see the familiar SAI truck on this remote road. There is a trucking business whose trucks have the letters SAIA emblazoned in red. Whenever I see these Sai trucks I automatically think of Sai Baba and attune to His Omnipresence. I usually see the Sai truck at the start of a journey. But these roads were so obscure I didn't expect to see it. Ho-sen whose name when translated means Dharma Springs pointed out various scenic landmarks. As we neared our destination I gawked in wonder and amazement as the SAIA truck rode into view. “SAI!” I exclaimed excitedly pointing towards the truck. Swami was blessing our journey. 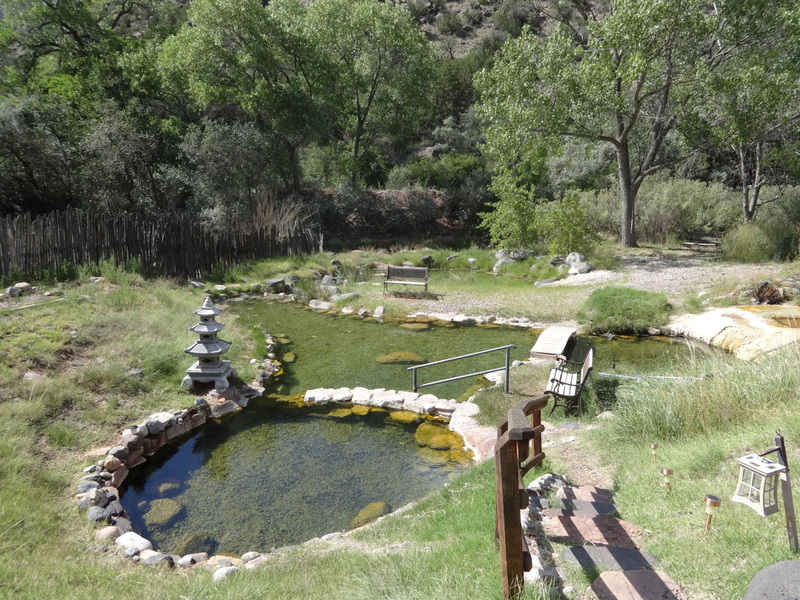 I could feel currents of tremendous spiritual energy emanating from the Bodhi Mandala Center and no wonder in addition to a rejuvenating, invigorating hot springs, the nuns and monks of the Center meditated 16 hours a day! The Center premises were exquisitely arranged and well taken care of. Everywhere clusters of clown yellow sunflowers waved a happy welcome. Tiny little chiquita hummingbirds their wings chanting Ommmmm sipped nectar from the many feeders dangling from the porches of the dormitories. O Swami I thought to myself, may we all learn to sip the nectar of love from Your vast heart. There was a large gong near the dining hall which announced the various activities. At dinner time Ho-sen and another lady Sei-sen explained the meal ritual. We were all given three bowls wrapped in a colorful cloth with a long ornate bag containing chopsticks and a spoon, a glass, a small white towel and another cloth on which we tagged our names. We each gathered our bowls and in an orderly line filled the bowls with delicious, healthy vegetarian food. After our meal there were basins and hot water arranged for each of us to clean our bowls and implements. Then we carefully dried and re-wrapped our eating-ware. We were shown a closet in which we placed our personal bowls and paraphernalia for the next meal. It was a very efficient and graceful way to manage communal eating and I rather enjoyed this little Zen ritual.